The Aquarium's Explorer in Residence Brian Skerry has been near some of our blue planet's most spectacular marine animals—from penguins in Antarctica to sleek sharks off New England to delicate sea fans in Indonesia. So when this experienced diver spent time underwater with what he calls "perfect ocean creatures" you know it was a noteworthy moment. It was an opportunity two decades in the making. 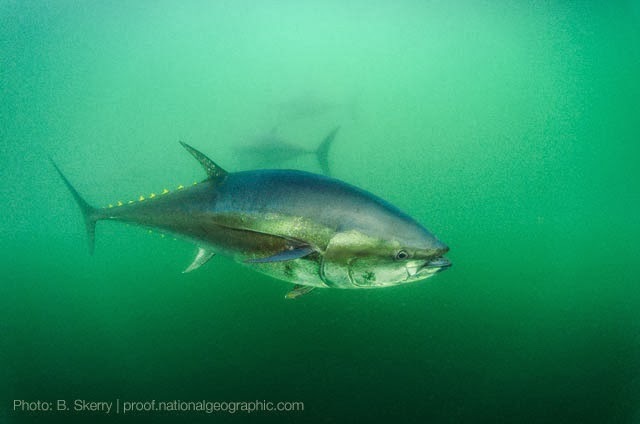 Brian's photographs illustrate this month's National Geographic cover story about bluefin tuna. On National Geographic's Proof blog, he shared a bit about the experience of photographing these massive fish. To be underwater with a bluefin tuna is to witness the divine sense of nature. They are true thoroughbreds of the sea, with few if any equals. This is an animal that swims across entire oceans in the course of each year and is capable of generating heat that allows it to travel practically from the equator to the poles. With a hydrodynamic design that has been studied by naval engineers, they swim faster than a torpedo and possess physical endurance that we can hardly fathom. It is a warm-blooded fish that continues to grow its entire life—a 30-year-old bluefin can weigh more than a ton—though as far as we know, none reach that age these days due to overwhelming fishing pressure. Read the full post and see more of Brian's pictures. Brian was the first photographer to slip amid the swirling schools of fish in the Giant Ocean Tank after top-to-bottom renovations. 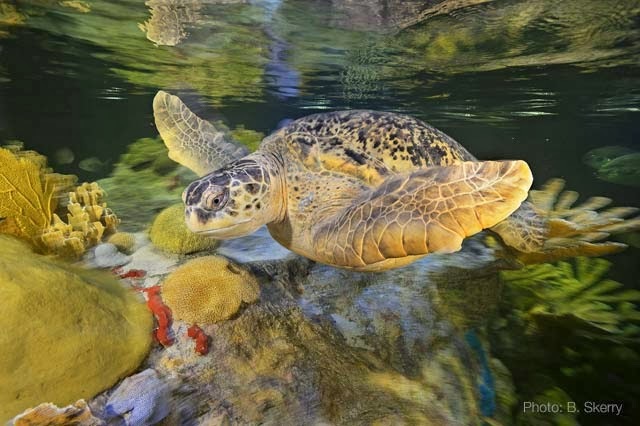 In addition to photographing the thousands of new corals and fish, his lens also turned the queen of the Giant Ocean Tank—Myrtle the green sea turtle. His work has also been featured in the Aquarium's member magazine blue as well as throughout the Global Explorers blog. Take a stroll through his many expeditions and essays to experience the beauty of our blue planet. Switching gears, don't miss a discussion about tuna in another part of the world—the Phoenix Island Protected Area—on the PIPA blog.